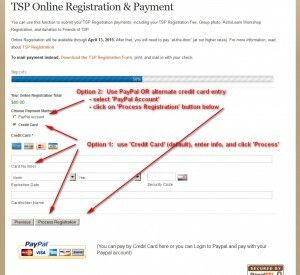 Here is guidance on how to get registered and complete your payment of TSP fees using our online payment system. You can click on any screenshot to see more detail and use your Browser back button to return to this page. 1. Everything you need to do can be found on the My TSP Account page. Can’t find the page? Move mouse pointer over ‘Registration’ located on the nav-bar at the top of our webpages. A dropdown display will appear. Move mouse pointer down to the ‘My TSP Account’ selection on the dropdown display and click on it. The ‘My TSP Account’ page will display. 2. You must have a TSP userid and logon. You are logged-on if you see your name at the upper right corner. Forgot your password? Click on the ‘Forgot your password?’ link at the bottom of the page. Enter your email address. We will email you a link to get a new password. 3. You must have submitted a TSP Registration/Reservation Request form, and we must have emailed to you a confirmation email. Look at our Registration process. No Request Listed? Submit one by clicking the ‘TSP Registration/Reservation Request Form’ link near the top of the page. You will initially receive an Acknowledgement email. Later on, you will receive a Confirmation email if your request is accepted. 4. You must complete your TSP Registration. If your Request is ‘Confirmed’, you will see links to ‘Pay Online Now’ or ‘Pay by Mail’. Paying by Mail? 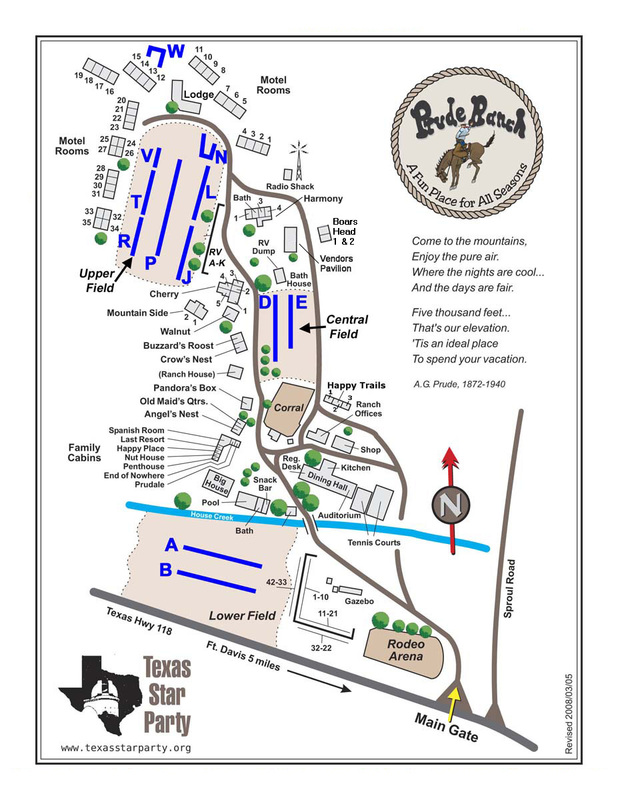 Download and print the TSP Registration form (includes the Prude Ranch Reservation form for separate payment of your Prude Ranch deposit if you are staying on the Ranch). Go to step 11. We’ll let you know when it is received by our Registrar. Paying Online? Click the ‘Pay Online Now’ link and see next step. 5. Fill out the online Registration Form, selecting the items that you want to pay for. You can also come back later and add other items to your registration. You will be able to pay for TSP Registration fee(s) for you and your family (including fee-waived college students), group photo, and Friends of TSP donation, if any. You will also be able to pay for special class registration fee and select specific classes to enroll. (when offered). You will see the total amount that you will need to pay, at the bottom of the page. 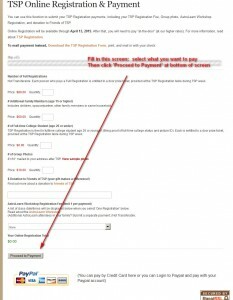 Click on ‘Proceed to Payment’ and the Payment page will be displayed. Note that our website is secured with encryption, which protects all information that you type into our forms. 6. Select your payment method. Option 1: Credit Card – Select ‘Credit Card’ for Payment Method, and enter credit card information . When done, click ‘Process Registration’ button at bottom. You are done! Go to step 10 below. 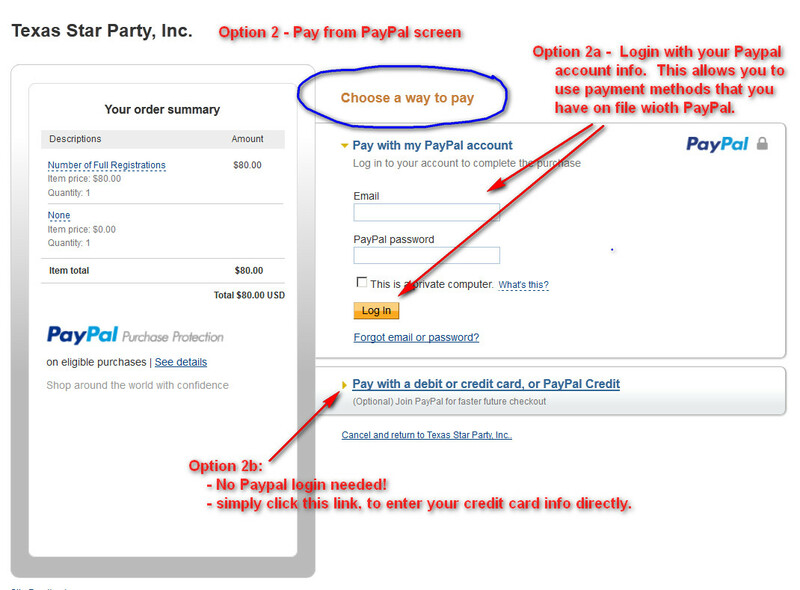 Option 2: PayPal or alternate credit card entry – Select ‘PayPal Account’ for Payment Method. (No other entry needed.) click ‘Process Registration’ button at bottom. The Pay from PayPal page will be displayed. See next step. 7. Choose a Payment method at PayPal. 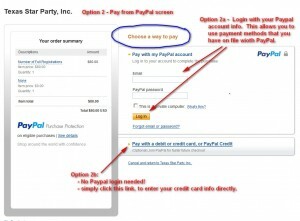 Option 2a – Login with your PayPal account info. Then click the ‘Login’ button. This allows you to use payments methods that you have on file previously with PayPal. If you choose this option, simply follow the various PayPal pages until you complete your payment. Skip to step 9 below. 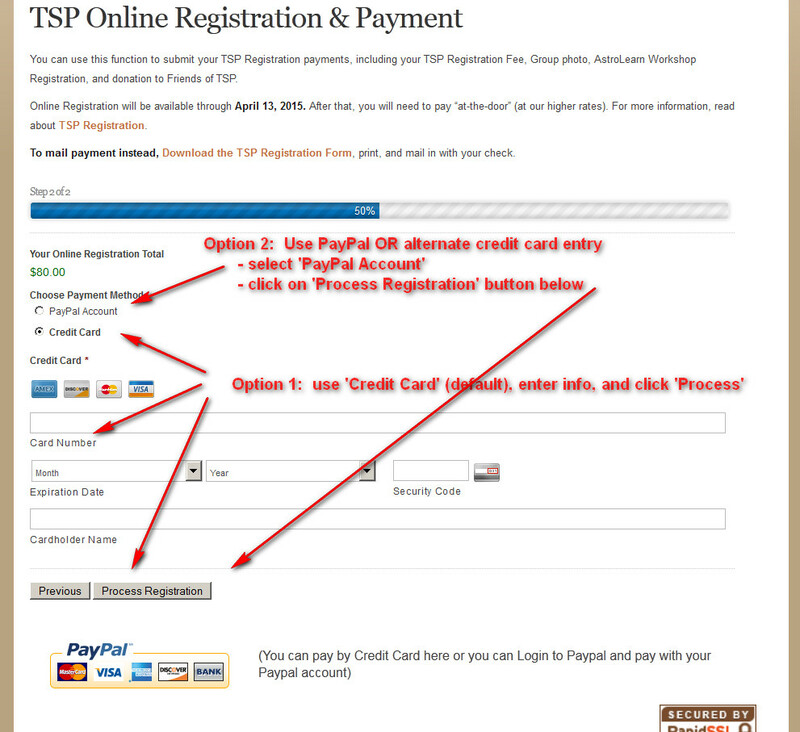 Option 2b – Enter your credit/debit card info (NO LOGIN REQUIRED!) Click on the ‘Pay with Debit or Credit Card’ link. The credit-card entry portion of the screen will expand so it is viewable. Go to step 8 below. Change your mind? Go back to TSP by clicking the ‘Cancel and Return to TSP’ link at the bottom of the page. Next you will see TSP’s Cancellation Notification page, which simply acknowledges that you cancelled your payment attempt. No payment was processed by PayPal! 8. 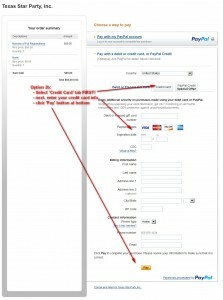 Enter your credit card information at PayPal. – Click on the Credit Card tab (or Debit/Gift card tab) as appropriate. – Click on the ‘Pay’ button at the bottom of the page. 9. 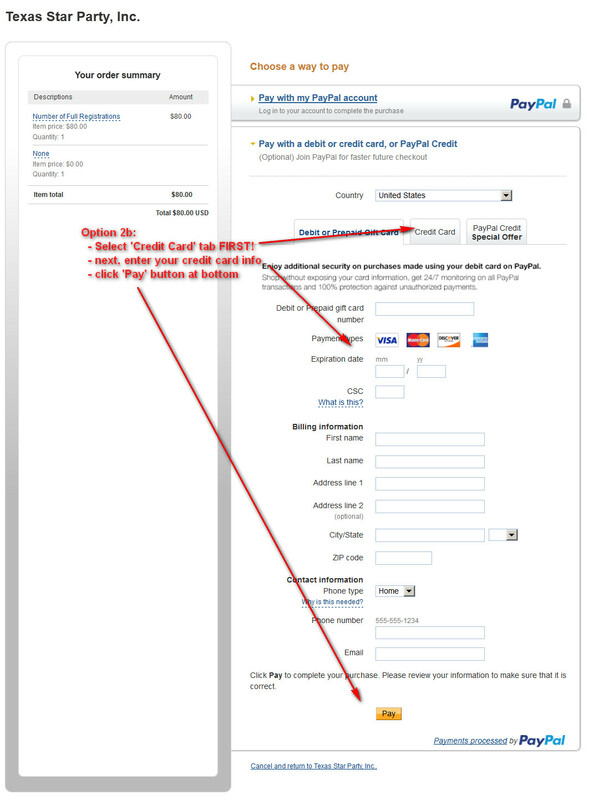 The PayPal payment confirmation page is displayed, if you enter valid and complete payment information. Click on the link to return to the TSP website. 10. 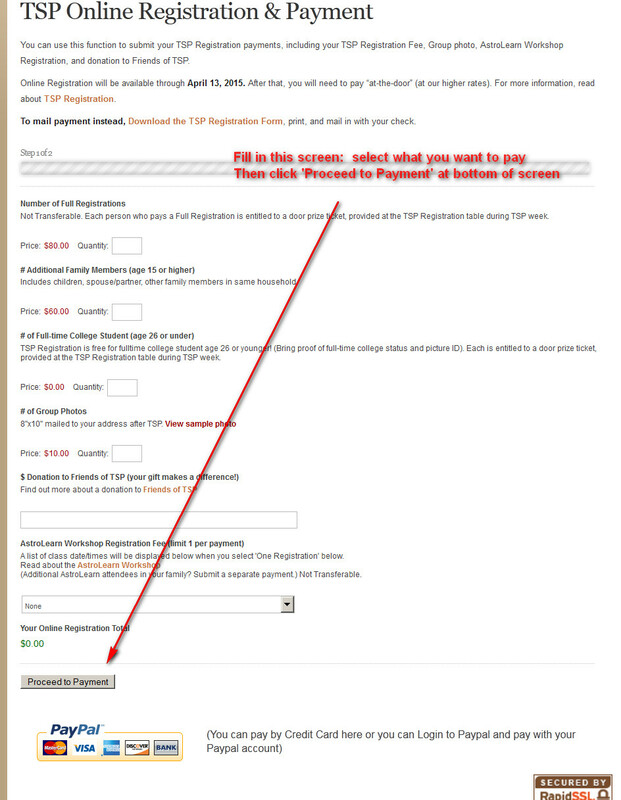 The TSP Online Payment Processing page is displayed which includes the message that your Registration is completed. Staying on the Ranch? Click the ‘Download Prude Ranch Reservation Form’ link. 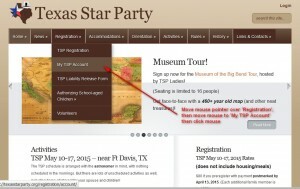 It is VERY important that you download and print the Prude Ranch Reservation form. MAIL IN to Prude Ranch with your deposit before the deposit deadline or you may lose your housing reservation! 11. Watch for your TSP Registration Complete email shortly. If you forget to print your Prude Ranch Reservation form, you can download it later by logging in at the My TSP Account page. The link is displayed in your Registration status section, but only if your TSP Registration/Reservation Request is Confirmed status. If you selected a deferred payment method in PayPal (including paying from a back account), we may delay sending your Registration Complete email until PayPal notifies us that the payment was deposited into our account. You can check the status of your Request and Registration by logging in at the My TSP Account page.